World War II started suddenly for the United States on December 7, 1941, with the bombing of Pearl Harbor. Within a matter of days, the Japanese population of Salinas, California was rounded up and deported to Heart Mountain Relocation Center, in Wyoming. This production is about these people and their ways of surviving their detention through the war. ‘Allegiance’ was inspired by talks with Star Trek’s George Takei, whose family was interned in Arkansas during the war; Takei starred in this production on Broadway in 2015-2016. 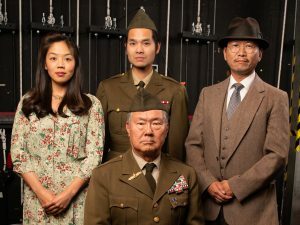 This SF Bay Area premiere production of ‘Allegiance’ at the Contra Costa Civic Theatre is directed by Lily Tung Crystal, who worked with Takei on some of the first readings. The show’s writers, Jay Kuo and Lorenzo Thione, attended the performance on September 23. The show opens with Sam Kimura, played by Dennis Yen, receiving an envelope from his older sister, Kei Kimura, played by Lindsay Hirata, who has just died. Kei’s spirit returns to entreat Sam to re-visit the old history of their internment before she can rest. Thus begins our journey as a flashback to the days of 1942. The story is told by a cast of extremely talented actors and singers who know and understand the traditions of their Japanese culture enough to explain them carefully to us. Although a small theatre, CCCT is rich in staging and performance history. The set was designed by Kuo-Hao Lo to be flexible and minimal, with moving sets and props that tell the story well. The songs are clear and beautiful. Kei’s opening number with Sammy Kimura, played by Vinh Hguyen, show us what their world was like before the war, and let us know that we are in for a treat with this musical saga. Hannah Campbell, played by Emma Onasch, works for the government at the camp, and lets us see the initial prejudice inherent of 1942 through her eyes. The allegiances of our characters is critical to the story, of course. Some characters want to show their allegiance to the US by supporting the war effort in Europe. Other characters want to protest the US actions against the Japanese interns to preserve their honor. In one song, “Get in the Game,” the company works through their different attitudes and decides to play a game of American baseball to pull together. In “Resist,” Nick Rodrigues, as Frankie Suzuki, sings with the company to resist the draft that the US has applied to the camp. In “This is Not Over,” Kei and Frankie sing about a love they found in the camp: “We are not over.. you are my future, not my past.. these moments will not be our last. You gave me hope when I had none.” These songs are beautiful images of hope in the midst of despair. 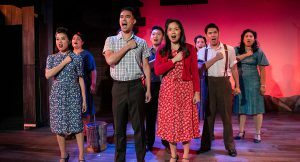 The director, Lily Tung Crystal, has put together a cast of very talented Japanese Americans to tell the story in a way that accurately reflects the hardships, the songs and the culture of the 1940’s camps. It is a joy to watch the jitterbug dances and old big-band singers that would have broken up the hard times in the centers. This production is an important window on an otherwise forgotten chapter in our history. “Allegiance” continues at the Contra Costa Civic Theatre in El Cerrito through October 21, 2018. For more information and tickets: http://ccct.org/ . ‘Allegiance,’ a SF Bay Area premiere by Marc Acito, Jay Kuo, Lorenzo Thione produced by Contra Costa Civic Theatre. Director: Lily Tung Crystal. Associate Director: May Liang. Music Director: Kenji Higashihama. Choreographer: Allison Paraiso-Silicani. Scenic Designer: Kuo-Hao Lo. Costume Designer: Lisa Danz. Lighting Designer: Courtney Johnson. Sound Designer: Michael Kelly. Properties: Devon LaBelle. Fight Choreographer: Dave Maier. Dialect Coach: Patrick Chew. Traditional Dance Choreographer: Ranko Ogura. Cast: Lindsay Hirata: Kei Kimura. Dennis Yen: Sam Kimura, Ojii-Chan. Vinh Nguyen: Sammy Kimura. Emma Onasch: Hannah Campbell. Nick Rodriques: Frankie Suzuki. Bryan Pangilinan: Tatsuo Kimura. Doy Charnsupharindr: Mike Masaoka, Photographer. Christopher Juan: Ben Masaoka, Victory Trio. Melvign Badiola: Johnny Goto. Juliet Evens: Sansei Woman, Mrs. Tanaka. Joseph Alvarado: Mr. Maruyama, Victory Trio. Pauli Amornkul: Mrs. Maruyama, No-No Girl. Jomar Martinez: Tom Maruyama. Anne Yumi Kobori: Peggy Maruyama, No-No Girl. Marah Sotelo: Nan Goto, No-No Girl. Domonic Tracy: Big Band Singer, Private Knight. Edward Nattenberg: Grocer, Recruiting Officer, Bullhorn Voice, Radio Announcer. Nicole Ogata: Betsy. Celeste Kamiya: Mary, No-No Girl. Alvin Castillo Bunales: Donald. Joseph Alvarado: Fight Captain. Nicole Ogata: Dance Captain.